An update may erase all the settings. In that case just go to Java's website to test and activate Java on your browser. When Mac OS is updated to a newer version or updated for Java some users may experience this issue even when they've set this up before. This is a common issue for Mac users. 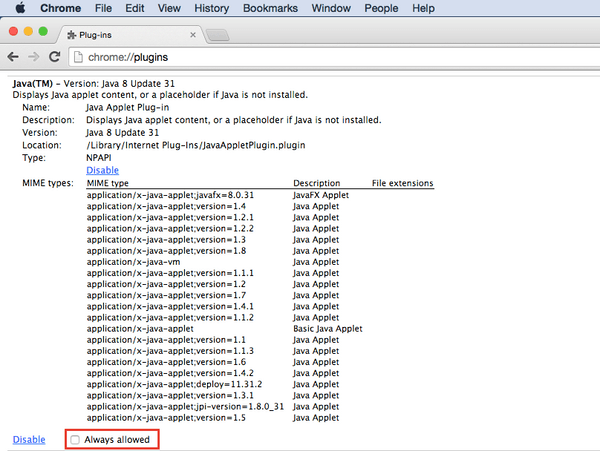 Step 1: Go to chrome://plugins to ensure that Java is enabled. You may want to ensure “Always allowed” is ticked. Step 2: Go to Java’s website http://www.java.com/en/download/testjava.jsp and follow the steps to confirm Java is working and that you have the latest version.